Yeah, I used to find that amusing — in a “Haha, the medication is worse than the disease” kind of way. Have you ever seen an 11-year-old have a complete breakdown or had them tell you they don’t belong in this world or this life? Have you ever had to spend two weeks driving two hours every day to visit your 11-year-old in the nearest psychiatric hospital for a few hours? Have you ever then spent two hours driving back home, crying the entire way because it breaks you apart to see your child trying to cope with detoxing from one medication and not yet being stable on a new one? You don’t want to. It’s terrifying. Then your child is released… and two days later has a sore throat and fever. You think it’s probably a bug or maybe strep, but the next day he has blisters in his mouth and throat, and his lips are basically nothing but blisters. It’s so painful he can’t even swallow water. You take him to his pediatrician, who thankfully knows his psychiatric history, that he’s just been released from the hospital, and most importantly, what new medications he started a few days ago. It’s not a random bug. It’s Stevens-Johnson syndrome, and it can occur with anticonvulsants (and some other medications). It can be deadly if not caught in time. Three days of having to check in with his doctor, who is watching to see if treatment is working fast enough because if there’s no or minimal improvement in three days, your child will be in ICU. Having his doctor actually breathe an audible sigh of relief that your child is out of the danger zone – the one you didn’t yet know existed – is simultaneously comforting and terrifying. I am grateful. Every. Single. Day. 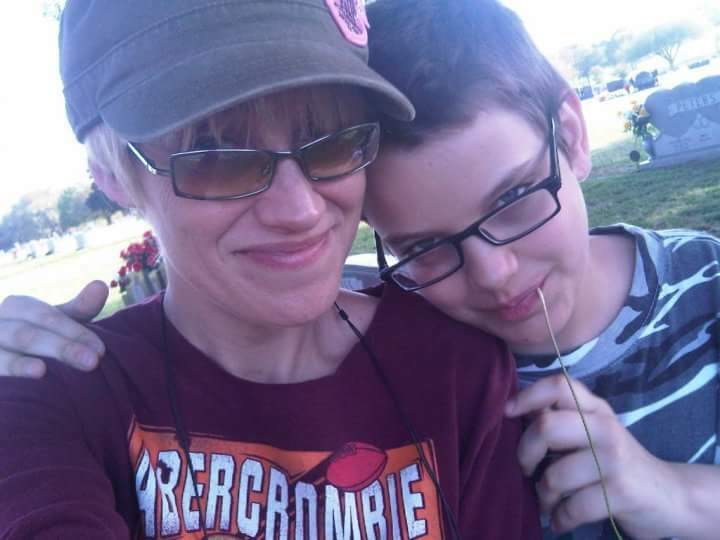 My son and I a few months after his hospitalization. I’m grateful I got to see him graduate and go to college at 16. Grateful for the 19-year-old he is now, full of snark and brilliant wit. Never, ever take medication warnings lightly. Always know the possible interactions. Tell your doctor and pharmacist what else you are taking, even if it doesn’t seem important: over the counter (OTC) medications, vitamins, everything. Read the drug information the pharmacy gives you with your prescriptions. Always. It is amazing how many people do not know what they are putting into their bodies, what the possible side effects are, or potential drug interactions (even with OTCs and vitamins). I’ve been flabbergasted that quite a few people don’t even know what symptoms a particular medication is prescribed to treat. It could be worth your life or the life of your loved one. Selena is a mom of four and grandma of six adorable grandkids. She takes in every stray that crosses her path, and currently has sixteen outside cats, two inside cats, and two rescued box turtles.